Over the years, I’ve wondered if these beliefs were unique to the musical micro-culture I inhabited as a student, or whether they are indeed held widely among string players. What do professional string quartets today each think about their own identities, and what attitudes do they hold toward the musical genre itself? Further, do these attitudes in some way translate to their “sound”—that mysterious sign of quiddity that emerges from the alchemically harmonious union of four individ­uals? The past couple of months, I’ve been on the lookout for quartet performances in Upstate New York and was lucky enough both to hear some interesting performances and to chat with members of the ensembles. 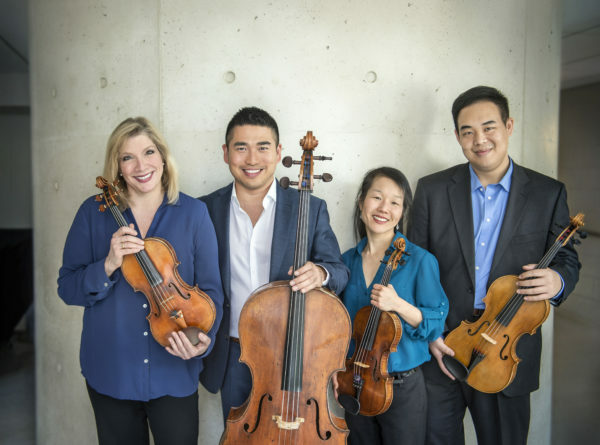 This spring, the Chiaroscuro Quartet was in residence at Mayfest, Cornell University’s international chamber music festival, which this year is celebrating its second decade under the artistic direction of Xak Bjerken and Miri Yampolsky. The quartet is virtually unknown in North America, and this residency marked the European quartet’s second group appearance in the United States (the first was at Mayfest in 2015). In Europe, however, their reputation for fresh interpretations of classical repertoire on gut strings has been growing. Recent accolades include the Förderpreis Deutschlandfunk/Musikfest Bremen in 2013 and the Preis der Deutschen Schallplattenkritik in 2015 for their recording of Mozart’s Quartet in D Minor, K. 421 and Mendelssohn’s Quartet No. 2 in A Minor, Op. 13. At Mayfest between May 19 and May 22, I heard their performances of J. S. Bach’s The Art of Fugue (Contrapunctus I, IV, IX), Fanny Mendelssohn’s Quartet in E-flat Major, Felix Mendelssohn’s Quartet No. 1 in E-flat Major, Op. 12, Franz Schubert’s Quartet No. 13 in A Minor (“Rosamunde”), Joseph Haydn’s Quartet in B-flat Major Op. 76, No. 4 (“Sunrise”), and Beethoven’s Quartet in G Major, Op. 18, No. 2. The Chiaroscuro Quartet interests me in their ability to confound expectations. Playing mainly repertoire from the classical period (roughly, Haydn to Schubert) on gut strings, they fall neither in the historically informed performance (HIP) camp nor the mainstream quartet camp. As I learned in conversation with the group, the quartet was originally brought together by chance: while students at the Royal College of Music in London, they were put together for a residency led by the early music conductor Sir Roger Norrington. (Three of the ensembles are founding members—Alina Ibragimova on first violin, Emilie Hörnlund on viola, and Claire Thirion on cello. Second violinist Pablo Hernán Benedí joined the group in 2009.) But while HIP has influenced the group’s approach to classical repertoire, in their individual careers they are not all “early music” musicians. Hörnlund currently serves as principal viola of the Swedish Royal Opera (a mainstream company); Benedí plays in a (modern) piano trio; Ibragimova has a busy solo life on steel strings; Thirion also plays modern cello but dwells more in “early music” territory for her professional life to a greater extent than the others. The Chiaroscuros’ ability to maintain a professional quartet while simultaneously pursuing individual careers in multiple countries is also, from a North American perspective, unusual. The group described their strategy of finding rehearsal periods between their individual engagements, most often intense week-long sessions at a compromise location (sometimes France, sometimes the UK, etc. . . .). Though this mode of rehearsal is not without challenges, they expressed to me the stimulation of working in this way. Never having to confront the doldrums of a regular schedule, they all arrive at rehearsal really wanting to play and ready to immerse themselves fully. Gut strings and HIP-influenced interpretations are used by the group more to expand the realm of aesthetic possibilities than to offer “authentic” performances. Certainly they do not insist on historical fingerings, ornamentation, and bowings in the way that the hardline “early music” ensembles do. In their best performances, this approach results in a sound that is fresh and unaffected. By freeing themselves from rigid conventions of both the mainstream and HIP, the quartet can pick, choose, and borrow according to their aesthetic convictions rather than from deference to orthopraxy. Likewise, within the group, they give themselves permission for each member to retain strikingly-different stylistic approaches. Thirion’s modus operandi, even to works as late as Schubert, is firmly rooted in basso continuo practice of HIP, while Benedí and Ibragimova vacillate between HIP-influenced bowings and twentieth-century virtuoso conventions. In their performances of Schubert’s “Rosamunde” Quartet and Mendelssohn’s Quartet No. 1, Op. 12, the group very successfully used their individual approaches to distinguish the musical roles intrinsic to the score. Ibragimova seemed to transform the shape of time itself through a wonderfully natural tempo rubato. Her melic genius is unrivaled by most anyone: she spontaneously bended, pulled, and molded the unfolding melody in seemingly infinite ways within the hypermeter established by the rest of the ensemble. Thirion meanwhile asserted herself as the fearless chief of harmonic basis and rhythmic impulse, switching on a dime between laying down intelligible, compelling basslines and breathing forth spectacular rumbles of sound and swashes of background color. Benedí and Hörnlund meanwhile were able to sense instantly and adjust to the particular function of their parts—whether to hover, wend, and twist with Ibragimova or to join the rhythm section with Thirion. For the Schubert and Mendelssohn, the effect was beguiling. Yet, in musical writing without a treble-bass polarity and which instead called for imitation or homogeneity, the group was less successful. I was taken aback and confused to observe four dramatically different performance styles in their rendition of movements from Bach’s The Art of Fugue. Thirion was employing performance practice techniques from circa 1720, Benedí from 1830, and Ibragimova from sometime after 1890. Hörnlund lines were, alas, either inaudible or unintelligible. While I enjoy this ensemble’s independence in other musical contexts, the imitative writing of The Art of Fugue would seem at a minimum to call for a basic agreement in style. Likewise, motivic imitation and “dovetailing” writing even in the later repertoire they played such as Fanny Mendelssohn’s Quartet in E-flat Major was marked by clunky connections and noticeably different phrasing. In particular, I found their interpretation of the first movement of the Fanny Mendelssohn quartet most unconvincing. It is, admittedly, an unusual composition that doesn’t quite balance with the remainder of the work; but their take on the first movement did not flatter it. Uncharac­teristically for this ensemble, their approach seemed affected. By grossly exaggerating individual gestures and fragmentation, they obfuscated structure and any sense of coherence over the course of the movement. I would recommend they rethink this one. Hearing and speaking with the Cavani Quartet at the Geneva Music Festival on Sunday, June 3, brought me back to the North American tradition of string quartet playing I’m more familiar with. The Geneva Festival was founded seven years ago by Geneva native and violinist Geoffrey Herd as a relatively small local festival. Over the past few years, however, it has blossomed into a substantial and high-quality festival that this year featured nine concerts over the course of two weeks in towns throughout the Seneca Lake region. The festival offerings were broad, including the Cavani Quartet, poet Mwatabu Okantah, Broadway singer Syndee Winters, jazz percussionist T. S. Monk, and violist Ettore Causa, among many other accomplished musicians from all over the country. Four concerts were programmed as an exploration and celebration of African American musicians, artists, and composers in genres ranging from classical, to jazz, to musical theater, with several outreach performances being offered in the area public schools. The festival has a lot of heart and bore all the signs of thoughtful and interesting programming, community engagement, and timely relevance. The flourishing of this festival has coincided with the reinvigoration of the town of Geneva (which recently was awarded a sizeable grant through Governor Cuomo’s Downtown Revitalization Initiative), and the excitement of the festival hitting its stride resonated with the buzz of optimism palpable around the town, from its beautiful public water­front to the quirky restaurants opening downtown. For me, my day in Geneva and at the festival provided a much-needed dose of hope for civic cooperation and betterment and for the possibility of real human connection. These values seemed to me immediately apparent in their perfor­mance. Their standards of professionalism in all domains were clearly pronounced, from their interactions with the audience and with each other, to the fineness of performance and forthrightness of interpretations. In their performance of Antonín Dvořák’s String Quartet No. 14 in A-flat Major, Op. 105, Fullard came to the forefront when appropriate to play with a more gutsy tone than the others; even so, the interaction and fitting-together of the parts was the highlight. It was in the second half, however, in which the quartet really shone. In this part of the program, the quartet collaborated with poet and Professor of Pan-African Studies at Kent State University Mwatabu Okantah in weaving together music for string quartet with poetry of Okantah and Langston Hughes. On paper, “Collage: Music and Poetry” might come across as yet another interdisciplinary collaboration conceived more for its “trendy” appeal than its genuine artistic value. But this project really delivers. Originally conceived to introduce young audiences to the mediums of chamber music and poetry, “Collage” has now been cultivated and refined over the course of thirty years into an artistic partnership that in my experience is utterly unique. I’ve heard a number of “poetry-pairing” nights at classical music festivals. Usually, they constitute nothing more than classical music acting as background music for poets to stand up at the mic and recite their own poetry from a piece of paper. But for the Cavanis, this collaboration has meant welcoming Okantah into their quartet—“for this project, we’re really a quintet,” they said—to make chamber music, in their robust, value-laden understanding of the term. It’s serious work. The players dove into the music wholeheartedly—no fluffing about just because this was a poetry “pairing.” I heard soulful renditions of Dvořák and gospel songs, sizzling Bartók, and swanky blues. Voice, language, rhythm, gesture, melody, phrase, sentence, articulation—these bumped into each other, conversed with each other, challenged and loved each other in a ravishing tapestry of audible human expression. Sometimes Okantah’s voice was a countermelody or accompaniment to a particular musical phrase; at other times it rose above the swell like the voice of the God of the Old Testament. No two selections I heard in this concert were approached in the same way. In their opening number, the poem “Collage” (the collaboration’s namesake) by Okantah was performed freely over the famous Lento movement from Dvořák’s “American” Quartet; Langston Hughes’s “Dream Boogie” was declaimed in response to the first movement of Béla Bartók’s String Quartet No. 4, while part of the fourth movement was recomposed for performance with Hughes’s “Parade.” Okantah’s poem “Market Day” was interwoven with the second movement of Ravel’s Quartet. Some of Okantah’s poems had newly composed music provided by friends of the quartet; the quartet composed or arranged music for others. Although “Collage” originated as an educational project, this collaboration didn’t shy away from difficult music or difficult ideas. For instance, Bartók’s Quartet No. 4 is not usually a piece one gravitates to for an “introduction” to chamber music. But as presented with Okantah’s performances of Langston Hughes, Bartók became an ecstatic jam of speech rhythms and the edgy interactions of a city. In subject matter, Okantah takes the listener from reminiscence and race in the Deep South to the Vietnam War, or from Harlem to the invisibility of people of color, all on a tongue so lyrical and a groove so persuasive, that one scarcely knows how one arrives at one emotion before being swept up by the next new idea. As I sat amongst an almost entirely white audience in rural New York State, I considered why this collaboration was so affecting. For me, besides taking aesthetic pleasure in the consummate artistry of these five performers, I was led to examine for myself the kinds of emotions I experience in art music and the associations I tend to link them to. Dvořák’s “American Quartet” I tend to associate with nature, the stillness and solemnity of the concert hall, or Dvořák himself—not with American slavery and the Harlem Renaissance that Okantah brilliantly barded. I never thought to connect the ebullient and soaring second movement of Ravel’s quartet to scenes from Nigeria, nor the emotions and attitudes I attach to the string quartet itself with old women sitting on porches in the Deep South. I was prompted to examine who and what populates my associations when listening to art music, and I learned that there was room for a whole world more. But all this was done without the performers having to preach, nor even to suggest a word of it. By simply bringing together these connections in such an evocative way, “Collage” taught me to introspect about how I experience and direct emotions, leading me toward possibilities for empathy and human connection in ways I couldn’t have envisioned. I think chamber music is one of those skills that is actually a useful skill for your life. . . . I would love to have someone who [had] trained as a chamber musician in pretty much any job. Because if they did it right, they should be the best colleague ever. They understand that when someone is telling you something—even when you don’t agree—that’s something that needs to be addressed. 100 percent of every human should have to do chamber music. Politicians should have to play chamber music! There’s a kind of euphoria that goes along with such confident belief in the social value of one’s artistic vocation. And one would surely think that such enthusiastic beliefs contribute in some way to the energy and quality of performances. But sometimes I wonder whether the Good News of the String Quartet harbors the latent implication that chamber music generally, and the quartet specifically, can preeminently instill social values. Are we to believe that they are really better at fostering cooperation, the capacity to give and receive constructive criticism, and the rest than dance, tennis, chess, working in private industry or government? By the reverse logic, couldn’t one reason that the best colleague at the local bank branch would make a great chamber musician? For that reason, should we suppose that all chamber musicians do a stint as a bank worker to hone their collaborative skills? Such questions are somewhat facetious (and in all truth, I myself concede the value of the arts in fostering social mores), but I’m curious about how individuals within string quartet culture also perceive these latent implications. The Euclids’ performance at the Mostly Modern Festival presented a full program of nine pieces of new music, which included three world premieres. This year in its inaugural season, the festival focuses on contemporary composition and performance. Besides an impressive lineup of artists and composers for their public performances, the festival, founded and directed by composer Robert Paterson and violinist Victoria Paterson, includes a new music institute for instrumentalists, vocalists, composers, and conductors. The number of world premieres at the festival (more than thirty) is extraordinary even among other new music festivals, and the artists this year numbered the American Modern Ensemble, The Euclid Quartet, Atlantic Brass Quintet, and the Imani Winds. Indeed, everything about the festival—its extensive programming, the quality of its artists, the sponsorships, merchandising, printed materials, and location—indicates that it is making a bid to establish itself quickly as a serious player on the summer music scene. They certainly have identified a niche: at the concert, throngs of institute students seemed to indicate a market for young musicians interested in new music, and their presence in the concert hall made for a general atmosphere of excitement. The particular performance I attended, however, was a bit of a let-down. The concert lasted almost three hours and, although it was crammed with the compositions of nine different composers, did not offer much variety in compositional style (which tended toward the conservative). I appreciated the effort to include a number of young composers in the lineup (Alec Radecki, Paul Frucht, and Corey Chang), but the sheer number of offerings on the docket, combined with the length, and, at times, the jejune attitudes of the performers, gave the overall effect of a glorified reading session. There was no single work, written either by young or more established composers, that served as a meaty focus for the audience to dig into intellectually. The first piece on the program, String Quartet No. 2 (2011) by David Del Tredici, perhaps could have served this function but was given the least convincing interpretation of any of the pieces that night. Intonation was an issue, awkward page turns disrupted the narrative flow, and there seems to have been little thought about how the movements should connect: before each movement there was an uncomfortable rustling, adjusting of instruments and chairs, fussing with the pages. The Euclids gave a more convincing performance in the second half of Robert Paterson’s String Quartet No. 1 (“Love Boat”) (1997), which included a witty contem­porary take on the tradition of incorporating popular tunes into art music. In this piece, and for the majority of the program, the quartet played with admirable clarity, sparkling virtuosity, and rhythmic incision that was matched with beautiful cantabile playing, especially from the viola and second violin. Paterson’s quartet abounded in humor and the kernels of rich ideas (such as an Ivesian treatment of country waltzes in the second movement and the clever incorporation of The Love Boat theme in the last movement), but at this point near the end of a long, unvaried concert my ears were longing for more of a challenge and for a real development of such kernels. All in all, this concert seemed to me much more for the sake of the composers than to highlight the artistry of the performers or provide a stimulating musical evening for the audience. I admired the quartet’s stamina and concentration in giving solid performances of three hours of music new to their repertory, but I felt that this “reading session” format didn’t give a representative taste of their abilities as a quartet. The string quartet is a genre of music, an ensemble of four people, and a music culture undergirded by musical and social tradition and expectation, but animated through the particular relationships devel­oped by each tiny, four-sided society (relationships with the music, composers, the public, and each other). As I’ve traipsed around Upstate music festivals in search of concepts and meanings of the string quartet, I’ve both become aware of the outlines of an intricate and widely-shared system of values and aesthetics, but also of the power of judgment and choice each individual brings to bear upon that system. In a time of globalization in which disparate traditions come into contact every day, and likewise, in a time in which it has become more and more acceptable for classically-trained musicians and composers to step over into other musical traditions (jazz, pop, world musics, etc. . . .), there’s no doubt that this venerable art will continue to grow and transform through the multifarious backgrounds and experiences individuals bring to it.